CEDAR CITY – A San Juan County commissioner has reported to jail to begin a 10-day sentence handed down by a federal judge in December. Phil Lyman reported to the Washington County Purgatory Correctional Facility in Hurricane Tuesday afternoon. 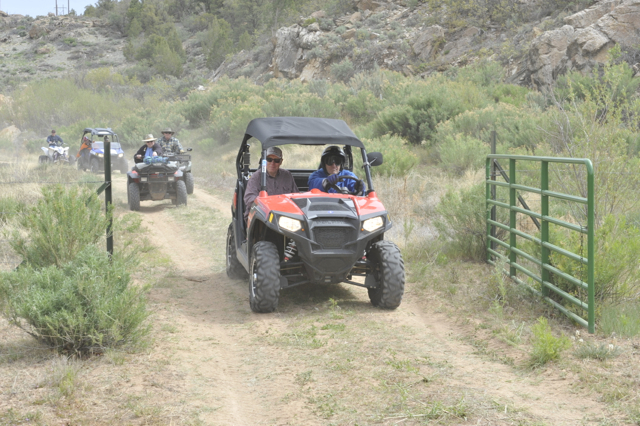 He was convicted last year by a jury for his role in organizing and leading a 2014 ATV protest ride through Recapture Canyon. Lyman and co-defendant Monte Wells were both found guilty of federal misdemeanor counts of conspiracy and driving motorized vehicles through public lands closed to vehicle use. Two other defendants in the case, Shane Marian and Franklin Holiday, were acquitted by the jury. The ride was in protest of federal road closures. Authorities argued Lyman and others rode through protected areas closed by the Bureau of Land Management and in so doing broke the law. In an interview with St. George News earlier this year, Lyman said he was nervous about his jail stay. U.S. District Court Judge David Nuffer sentenced Lyman in December but gave him until after tax season to report to jail because Lyman is a Certified Public Accountant. Wells, who was sentenced at the same time as Lyman, completed his five-day stay in jail in January. Both men were sentenced to three years probation and ordered “to promote respect for the law” during that time. “I’m going to impose a prohibition against advocacy of land use law violations,” Nuffer said. The judge also imposed a $96,000 restitution on Wells. Lyman’s sentence will be over on April 28. The commissioner filed an appeal on his case in January with the 10th Circuit Court of Appeals. For the time being, he is acting as his own attorney. In the previous interview with St. George News Lyman maintained his innocence saying he has proof he did not break the law. “I didn’t break the law and I want to prove that,” he said. Lyman said he has a recorded phone conversation between himself and then BLM director, Juan Palma, that proves Palma gave his blessing on the ride just nine days before the event took place. Judge Robert Shelby refused to allow the recording into evidence. Lyman blames his attorneys for the dismissal of the tape saying they didn’t defend him properly. Wells has also filed an appeal in the case. Have a nice stay Phil. I bet you’ll come out rehabilitated. Yep, protesting the BLM heavy hand of tyranny will get you jail time and financial ruin boys and girls. Guess we all better just sit down and shut up. Oh wait, this is America and we were founded on standing us against despots. BLM is a useless group of power hungry people, nothing more.